With an average 4.8 star rating, as well as being the most downloaded basketball game in it’s debut weekend on the Apple App Store*, All-Star Basketball is now available for Android devices on Google Play. 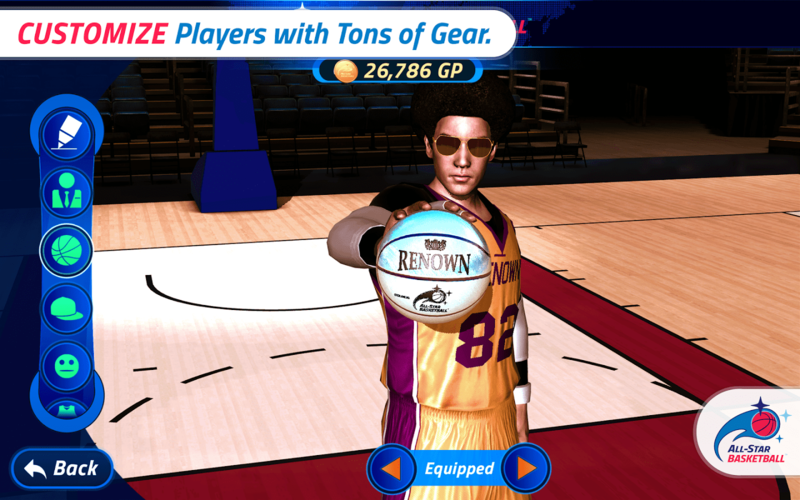 The team at Renown Entertainment utilized additional polish time for the Android version of All-Star Basketball to ensure its new legacy as the top rated, best playing arcade hoops shooter in the sports game category. The Android version is more than a straight port, offering an improved experience compared to previous platform releases. Additionally, this release introduces cross-platform matchmaking for Online Versus. Test your skills against both Android and iOS players in real-time shootouts to win gold for in-game rewards and claim court supremacy. 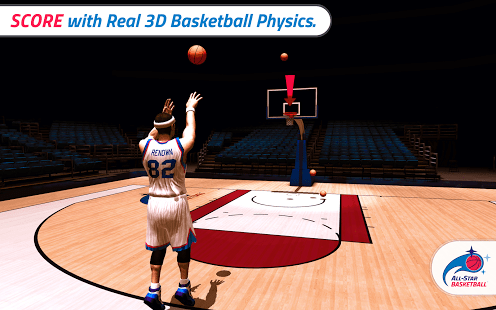 Experience the most realistic 3D basketball shot physics with customizable player avatars, arcade power-ups, console quality graphics, cloth simulation, and many other next-gen features for the first time on your Android device. Gamers take note that next-gen features require an Android device with a Quad-Core CPU running at 1GHz or better with 1GB of RAM. Enjoy single player in a variety of game modes ranging from Moving Hoop to the ever popular 3 Point Challenge based on the annual NBA All-Star Weekend. Climb the ranks through Google Play Services leaderboards and aim for the top spot. Win gold points with each game to redeem a variety of items including power-ups with vibrant kinetic visual effects to compliment your play style, defeat opponents, and maximize your high score. Customize your player avatar in 3D with pro gear and swag to show off your personal baller style. Sharpen your skills in immersive global venues from Canada to Southeast Asia and prove that you’re the king of the court! Power Up Your Game – Get the edge and use Power-Ups to maximize your score and defeat opponents. Freeze time for precious extra seconds in a race against the clock, or clinch your shot by magnetizing the ball through the rim and much, much more based on your play style and strategy. Customize Your Players – Thousands of 3D pro, retro and street customization combos limited only by your imagination. Sport gear and uniforms like LeBron James, San Antonio Spurs superstar Tony Parker, and other pro NBA Teams. Redeem GP earned from single player or online games and show your personal baller style and the spoils of victory. Online Versus** – Play online and test your skills against other real, live opponents across multiple platforms! 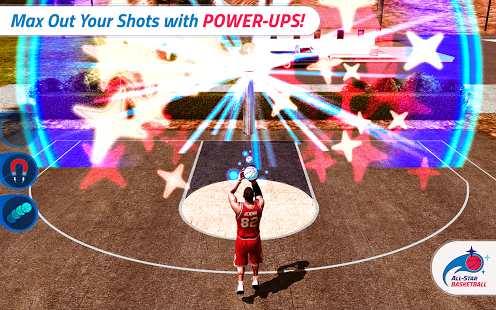 Can you make the shot and claim the victory or will you re-match your opponent and show them that they just got lucky? Who will bring home the gold? Next Generation Graphics & Physics – All-Star Basketball has it all from highly accurate ball physics and bounce to real-time cloth simulation. We took the best visual and physics features the consoles have (like the latest Playstation and XBox) and put it on your Android device! All-Star Basketball was created by former EA Sports developers who have previously contributed to the NBA Live, NBA Street, NCAA Basketball, FIFA, FIFA Street, Madden NFL, NHL, and PGA Tour franchises. Drawing on their experience in AAA game development and popular mobile titles such as Ball-Hop™ and Waves Survivor™, Renown sought to create a quick and fun, pick-up and play experience tailored for mobile devices with next-gen visual quality. Install it now for free and get your BBall game on! In-app Products – $0.99 – $43.99 per item – note – this download is the full version of the game and it can be played for free without making any IAPs. This entry was posted on Thursday, November 6th, 2014 at 12:48 pm and is filed under Everyone, Mobile, National News, New Releases, Sports. You can follow any responses to this entry through the RSS 2.0 feed. You can leave a response, or trackback from your own site.